They say Scorpios are the most intense of all signs and being one myself, I totally agree. We also get along well with fellow Scorpios and other water signs, so when I first met Scott Wiener, I knew right away this guy was great as a human and extremely dedicated to what he loves : PIZZA. I already had known of Scott back in 2009 and admired him for his work in the Pizza World; so when we bumped into each other at Keste a few weeks after their grand opening, it felt like I already knew him for years. Scott Wiener has vision. He leads armies of hungry Pizza Tourists across New York City, stopping by many pizzerias, equipped with different ovens, making different types of Pizzas. Mr. Wiener patiently educates his followers and informs them of the many differences between New York Style Coal Oven Pizzas, Neapolitan Wood Fired Pizzas, and the classic New York Gas Oven Pizza by the slice. He moves quickly, like a Batman of San Marzano. That spring in 2009, he came into Keste with a group of pizza-loving tourists, and we instantly recognized each other. He opened the latest PMQ magazine he had in hand and showed me an article with info about me in it. I was amazed; he was gracious. He educated his group and then was out the door, promising we would meet up soon. Scott has great people skills and everyone who meets him, remembers him. It’s not just his charisma that people find appealing, but also his big heart. 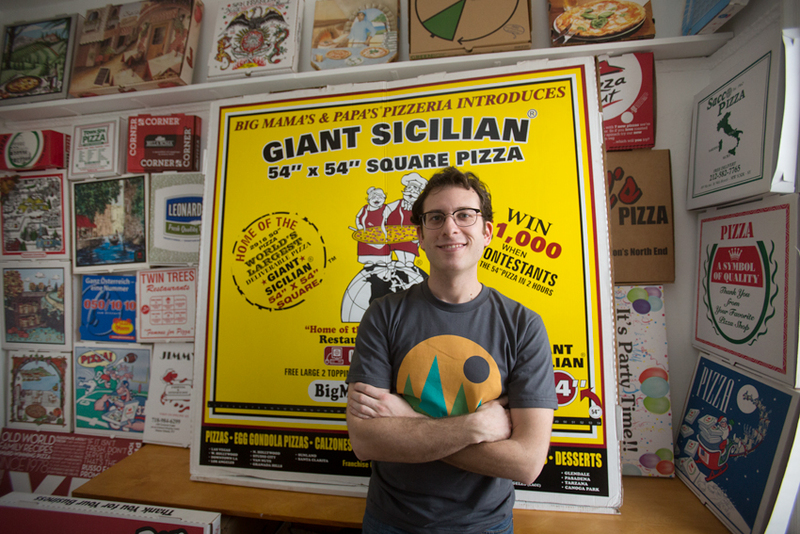 It is Scott Wiener who started “Slice Out Hunger” and helped it become a MEGA force in the pizza AND food bank worlds. He reached out to hundreds of New York Pizzerias and with their donations, helped raise tens of thousands of dollars to feed the hungry. With so much on his plate, Piazza Life was grateful to get a “slice” of time with Scott Wiener. 1) You probably have the world record for pizza boxes. Which are your top 5 favorites? Yep, I do have the world’s largest collection of unique pizza boxes! It’s hard to pick five favorites but there are a few I really love. 2) Why did you start collecting pizza boxes? Most people assume all pizza boxes are the same but that’s far from true. When you see something that’s familiar in shape and function, but has completely unexpected art I think it’s really interesting. I first saw an unusual box in Israel in 2008 and that made me pay more attention to pizza boxes from that point onward. It seemed like a fun thing to collect. 3) You have one of the best and most sought after tours in New York City. How has your tour business grown and changed since you first started it? It’s funny, I never had a real plan for the tours but I just try to do what makes sense. I’ve added a couple tour options over the years and in the past 12 months I’ve brought on a few more pizza enthusiasts to run tours with me. It’s a lot of fun and we all get together to eat pizza and talk about pizza once a month. 4) Ever have to rough an unruly tourist up for eating too many pizzas? Maybe drag them to Pizza Therapy? Only fools rush their pizza eating. We’re fortunate that we tend to get serious pizza lovers on most tours so they understand how to pace themselves. The whole tour is a bit like pizza therapy! 5) Which tour do you prefer? The walking one or the big yellow school bus one? I like the walking tour, but the bus tour travels farther and only happens on Sunday so I really dig that one. It’s a bit more of a party vibe while the walking tours are a bit more instructional. 6) Top 5 favorite pizzas in the world? That’s a really tough one. I’ll have to answer based on single pizzas I’ve eaten over the years. In no particular order: the Pizza Marinara I ate at Pizzeria Da Michele in 2009; the Rosa I ate at Pizzeria Bianco in Phoenix in 2009; the Greenpointer I had at Paulie Gee’s a couple years ago; the Upside Down slice at NY Pizza Suprema I had last summer before going to see Fleetwood Mack at Madison Square Garden; the red pepper flake, fennel seed, fresh/low moisture mozz pie I made at Pizza A Casa on February 1 of this year. Those were all really memorable. I know I’ve had a ton more great pies but those are five that pop into my head right now. 7) Those who know you know you are a really special guy. You don’t just have big ideas that are rooted in goodness, but you put them into action. You started “Slice Out Hunger”, which brings together many of the New York’s top pizzerias, and helped fundraise for City Harvest, a Food Rescue Organization that helps feed New York’s hungry. You, as well as those who participated, helped raise $20,000 !!!! Where did this great idea come from and what is the future for “Slice Out Hunger” ? This is the most important thing for me and I work harder on it than anything else. It all started when a couple of pizzerias offered to give me a few free pies to celebrate the 1st anniversary of my pizza tour company. I figured I might as well use the pizzas to raise some money for the homeless rather than just eat it with friends for free. That snowballed over the years and now we’re getting over 800 pizzas from over 40 of NYC’s best pizzerias to raise a ton of money and feed people in need. This year, as we did last year, we’re raising money for the Food Bank For New York City, an organization that provides 5 meals for every dollar they raise. Our 2014 goal is $50,000 to fund 250,000 meals for the hungry. We have a pretty cool plan to make that happen by taking on a bunch of matching sponsors. Once we can prove this is a great event for sponsors, I think we can take it nationwide and really do a lot of good for the hungry. Nobody should go hungry and it’s our responsibility to look out for each other. 8) Would you not eat pizza for 3 years for $ 1 Million? COULD you be able do that? I could do one year, but 3 is way too long to go without a slice. I’ll take the pizza. 9) Your book “Viva La PIzza” takes a look at almost half a century ( ! ) of pizza box designs and trends. Tell us more about it. Pizza box design is only as old as delivery pizza, which really picked up in the late 1950s. You can see developments in design as printing technology improves. It’s really neat to see the absolutely beautiful boxes coming out of Italy, they’re completely amazing and not at all recognizable to those of us who think of pizza boxes as white cardboard printed with smudgy red ink. 10) After all this pizza eating, what IS your cholesterol? Great question, I just had it checked. Overall is 153 with LDL at 88, so I’m totally in good shape! It helps that I eat oatmeal every morning, veggies at night, and swim or ride my bike just about every day. Tough to maintain but so far, so good! 11) Last meal (I’m assuming pizza, if so ..WHICH) ? Really tough one, but I think about it all the time. If I have to go on living a pizza less life I’ll end with a crappy pizza like Papa John’s. That kind of pizza would make me want to never have a slice again, so that might be a good one. If the world is coming to an end, I’ll pick a pizzeria that makes me feel cozy and at home. Something like Sam’s Restaurant or Arturo’s would do the trick. If the place I grew up with was still in its old location I’d go there. 12) Do you believe in an After Life? This entry was posted in Interview Of The Week, Italy, Food, Entrepreneur and tagged Pizza, Scott Wiener, Pizza Tour, Slice Out Hunger by piazzalife. Bookmark the permalink.